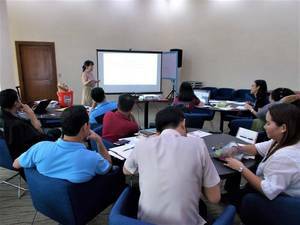 Asian Disaster Reduction Center (ADRC)　Activities:Japan-ASEAN Integration Fund Project "Promotion of Disaster Education in Schools"
The Training of Trainers for "Promotion of Disaster Education of Schools" project was held in Makati city, Philippines, on 14th March 2019. It was organized in cooperation with SEEDS Asia, Department of Education, and Makati City Government. 9 trainers from Makati city from Disaster Risk Reduction and Management Office, League of Barangays, Information and Community Relations Department, Urban Development Department, and Department of Education Makati City Division attended this workshop. Japanese expert, Ms. Saki Arima from SEEDS Asia made a lectures using the hazard simulation models which present hazard mechanisms, impacts and protective measures. Also as a result of discussion, the next seminar will be held with targeting the school teacher of Grade 7-10.